The Festival is open weekends, with a special day for schools and seniors on Festival Friday, March 23rd, 2018. The Festival is open from 10 am – 6 pm, Rain or Shine. 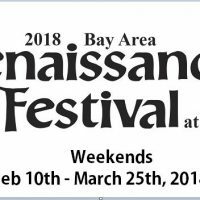 Take a time-travel adventure into the 16th century at the annual Bay Area Renaissance Festival! Join our Queen in a jubilee! Journey back in time as more than 100 merchants contribute to the atmosphere of this charming 16th century village. Experience live armored jousting, 12 stages of entertainment, 7 theme weekends, and fun and food for the whole family!